CD4518 Dual BCD Up-Counter and CD4520 Dual Binary Up-Counter each consist of two identical, internally synchronous 4-stage Counters The Counter stages are D-type Flip-Flops having interchangeable Clock and ENABLE lines for incrementing on either the positive-going or negative-going transition. 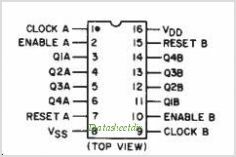 For single-unit operation the ENABLE input is maintained high and the Counter advances on each positive-going transition of the Clock The Counters are cleared by high levels on their RESET lines. The Counter CAN be cascaded in the ripple mode by connecting Q4 to the enable input of the subsequent Counter while the Clock input of the latter is held low. The CD4518B and CD4520B types are supplied in 16-lead hermetic dual-in-line ceramic packages (F3A suffix), 16-lead dual-in-line plastic packages (E suffix), 16-lead small-outline packages (M, M96, and NSR suffixes), and 16-lead thin shrink small-outline packages (PW and PWR suffixes). This is one package pinout of CD4520B,If you need more pinouts please download CD4520B's pdf datasheet. CD4520B circuits will be updated soon..., now you can download the pdf datasheet to check the circuits!